A Brief History of M.A.B. I have waited many years for someone to write a history of MAB, and finally in the year 2015 Jean-Pierre Bastié and Daniel Casanova have obliged. This article owes a great deal to their book Les Pistolets MAB which unfortunately is available only in French. Léon Barthe was born in the village of St.-Vincent-de-Tyrosse, about 25 kilometers north of Bayonne, in 1882. He studied gunsmithing in Liege and finished his schooling in St. Etienne. Soon after finishing school he moved to Bayonne where, in 1904 at the age of 22, he opened a shop at 9 Rue Gambetta where he sold hunting supplies, guns, and ammunition. Before World War I he began to import a small 6.35mm pistol made by Gregorio Bolumburu of Eibar, Spain, which was marked ‘REX’ on the left side of the slide, and later ‘PISTOLET AUTOMATIQUE “REX”’ with the word ‘BAYONNE’ on the line below. These pistols have checkered horn grips with a single grip screw. After the war, which flooded France with cheap automatic pistols from Spain, weapons for self-defense purposes were perfectly legal, and Léon Barthe’s business prospered. On 14 December 1920, Barthe established a business with the name Manufacture d’Armes Automatiques, which was soon changed to Manufacture d’Armes de Bayonne. Bastié and Casanova explain that the initials “MAB” made the company sound like MAC, MAP, or MATTE, which were the initials of the French government armories which manufactured pistols for the military. This made the company seem familiar and more acceptable to French buyers. It must have been about this time that Barthe began to put his own grip plates on the REX pistol. The grip plates were made of checkered horn and had the monogram M-A-B in an oval in the center, and were held in place by two grip screws. The slide inscription was changed to read MANUFACTURE D'ARMES AUTOMATIQUES / PISTOLET AUTOMATIQUE 635 “MAB” / BAYONNE, and later to PISTOLET AUTOMATIQUE CAL. 635 / M.A.B. / FABRICATION FRANÇAISE. The letters “MAB” appear in an oval cartouche at the rear of the frame on the left side. These guns are sometimes referred to as the Type I Model A.
Barthe established a factory on the Allées Marines, the street which runs along the south side of the Adour River, and hired a number of Basque gunsmiths, many of whom were out of work after the war. He also retained his gun shop on the Rue Gambetta, which continued in operation until 1940. Léon Barthe died on 14 April 1937 at the age of 54. Production of the Type II Model A in blue began in January 1925. A nickel version appeared in November of 1929. 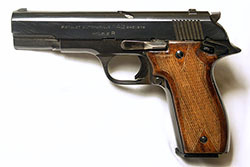 The Type II was based on the 1906 Browning/1908 Colt design (which was a downsized version of the 1903 Colt), and M.A.B. did not eliminate the grip safety as so many other copies did, though the internal lockwork was redesigned. The trigger and extractor were initially milled from steel, but after May of 1948 they were stamped from drawn sheet steel. The magazine held 6 rounds. The first serial number for a Type 2 was 10001. The only other serial number information I have been able to find for the Model A is for those that were procured by the Germans during the occupation of France in World War II: 107,900 to 109,240. Production of the Model A ceased in September of 1964, though old stock continued to be available for several years. The .25 caliber Model B (Modèle B) is externally a close copy of the Walther Model 9, with a fixed barrel, an open-top slide, a top-mounted spring-steel extractor, and a magazine safety. The connector bar, disconnector, and manual safety of the Model B are almost identical to those of the Type 2 Model A, and differ considerably from the Walther internals. Takedown of the Model B is accomplished via a catch at the rear, which slides down to allow removal of the striker, striker spring, and the backstop to the striker. This in turn allows the slide to be drawn back, lifted up, and eased off the front of the gun. 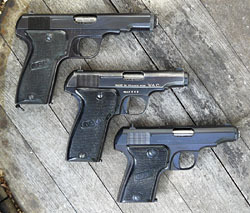 The Model B is slightly larger and heavier than the Walther Model 9, but 12mm shorter than the Model A and 75 grams lighter. The magazine holds six rounds. The Model B was made from 1932 to 1949, but was still being exported from existing stock as late as 1957. It is relatively scarce in the U.S.
had its barrel bushing held in place by a spring-loaded mortise & tenon style latch on the bottom of the slide. In the later version (Type 2) the latch was eliminated in favor of a bayonette- style bushing and the extractor was stamped rather than machined. According to Huon, this change took place in November of 1946, beginning with serial number 56,081; however, he is referring to the Model D, as there are no Model C serial numbers in this range. The Model C bushing changed somewhere in the 13,000 to 14,000 range. The design of the flat spring for the grip safety was changed in March of 1950. According to Huon, production of the .380 version ended in November of 1963, while the .32 was produced until November of 1967. 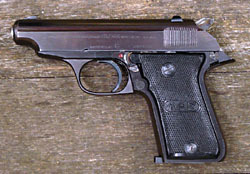 The Model C was widely used by police agencies in France. Beginning on 2 January 1950, what came to be known as the Model C/D was produced, in both calibers, with the short barrel and slide of the Model C but with the larger grip and magazine capacity of the Model D. However, these guns were marked simply Modèle C, probably because the guns were assembled from existing stocks of Model D frames and Model C slides and the model designation was already engraved on the slides. The company saw no need to make a second set of slides with different markings. The standard Model C had a 7 round magazine capacity (6 rounds for .380), while the Model C/D had a 9 round capacity (8 for .380). C/D production was discontinued for a time in 1958, but was restarted several times as demand dictated; it was discontinued for good in March of 1964. The Model D (Modèle D) in .380 caliber was simply an enlarged Model C with a longer barrel and slide, a deeper grip and a correspondingly greater magazine capacity (9 rounds of .32 or 8 rounds of .380), which appeared simultaneously with the .380 Model C in September of 1933. The .32 caliber version of the Model D appeared on September 30. 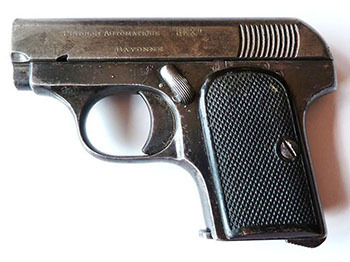 The Model D pistols sported a military style lanyard ring at the base of the grip, and were widely used by the French police, customs, and the forest service. A special series was produced for the Bank of France with serial numbers prefaced by BF. The early version of the model D (Type 1) had a different style barrel bushing with a latch on the bottom of the slide (like the Type 1 Model C). The latch was eliminated for the Model D on 11 June 1945. 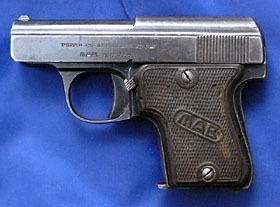 The Model D was MAB’s most successful pistol until the advent of the PA-15 in 1966. In 1939 the French military contracted for 16,000 Model D pistols, the serial numbers of which run from around 31,000 to 47,000. Most of the Model Ds went to the French Navy and were stamped or engraved with an anchor on the right side of the slide. Model Ds produced during the German occupation should range from approximately 47,000 to 97,000, plus L1 through L1160. The Model D was manufactured from 1933 until 1964, and again from 1966 or ‘67 until 1982. The Model E (Modèle E) was essentially a down-sized Model D (total length about the same as a Model C) chambered for the .25 ACP cartridge. It held 9 rounds. The Model E was manufactured from March of 1949 to April of 1964. I speculate that this gun was produced primarily for French consumption because ownership of the larger calibers was restricted. They are scarce in the U.S. The Model F (Modèle F) was a single-action, unlocked breech .22 caliber target pistol with an open-top slide similar to the Model B, an internal hammer, and a side-mounted extractor. It could be purchased with barrels of various lengths and a number of different target sights. Huon states that the Model F was produced from April of 1950 to April of 1963, but Hogg and Walter assert that the production dates were 1950-1985. Josserand states the gun was made in four barrel lengths: 4”, 4.5”, 6”, and 7”, whereas Huon gives eight different lengths that were produced at various times. The Model F is unique as far as I know in having a small lever on the left rear of the slide which serves to lock the breech. The Model G (Modèle G) was offered in .22 and .32 chamberings. It was an unlocked breech pistol with a pointed grip tang and a rebounding hammer, and was nearly identical in size to the Model C. The Model G was a copy of the Spanish Echasa “Fast” pistol, which appeared in 1948 and which in turn was a simplified copy of the Walther PP. The Echasa and M.A.B. Model G were both single-action only, unlike the Walther. According to Hogg & Walter the Model G was introduced in 1950, but advertisements from the era do not show it, and a factory letter dated 20 October 1958 states that it was introduced in .22 caliber on 1 January 1957. The Model G had 19 fine vertical serrations at the rear of the slide, also similar to those on the R-series. The take-down was a rectangular sliding latch (unlike the Walther PP, which had a hinged trigger guard) at the rear of the frame on the left side of the gun. The G I have has a steel frame. Several sources, including Josserand, Huon, and Hogg & Weeks, do not mention the Model G at all (only the GZ). Hogg & Walter list both the G and GZ models. The Model GZ (Modèle GZ), according to Josserand and Huon, was originally made in France, beginning on 1 January 1957, but the license was sold to Echasa (Echave y Arizmendi) in Eibar, Spain in 1962. I have a photograph of a French-made GZ, otherwise I might doubt it was ever made in France. The Model GZ is nearly identical to the Model G with the external hammer, but has distinctly different slide serrations. Some GZs have five broad, angled, square-cut slide serrations, while others have eight narrow angled square-cut serrations. Huon states that the GZ has an alloy frame. The Spanish GZ has an alloy frame, and was available in .22, .25, .32, and .380. The Spanish-made guns are clearly marked ECHASA. EIBAR (ESPAÑA) and MAB ESPAÑOLA on the left side of the slide, and some have MAB ESPAÑOLA on the grips as well. Production ended in May 1964. The Model R (Modèle R) was an unlocked breech pistol produced in 5 calibers, including .22 long rifle, .22 short, .32, .32 French long, .380, and 9mm. It looked like a Model D with an external hammer and no grip safety. Most previous M.A.B.s had been striker-fired. Unlike all previous MAB’s, the slide locked open after the last round was fired, and closed when a new magazine was inserted. The first R -series gun to be released was a version in the .32 French long caliber on 23 July 1950. This gun was the first MAB directed at the military market, but unfortunately the French military were already looking for a pistol in 9mm Parabellum, so the MAB R-32 Long was never even considered. In February of 1951 the R-32 was intruduced in .32 caliber (7.65mm Browning), and in October of the same year the R-9 was introduced in 9mm Parabellum. There is much confusion about the R-9 (also known as the R-Para). Several sources state that the R-9 had a delayed-blowback rotating barrel action based on the Savage design. This is the gun referred to in the Standard Catalog of Firearms as the R Para Experimental. In reality, however, this rotary barrel pistol was a prototype for the later P-8 and did not appear until about 1965 or 1966. However, these prototypes were marked with the same roll stamp as the Model R--hence the confusion. The true R-9 from 1951 is an unlocked-breech pistol akin to the R-32. This is the version which I believe Huon is referring to when he says, “The mass production of the MAB R 9mm Parabellum began on February 1952 and did not end until November 1963.” In those 12 years of production, probably not many more than 1450 R-9s were produced. The Model R-22 differed from the other R-series guns. Built on the same frame as the R-32, it was made, according to Josserand, with an open-top slide in three barrel lengths (4.4 , 6.7, and 7.4 inches). It was a very different gun from Model F, with an external hammer and different lockwork. However, the R-22 shares a nearly identical barrel with the MAB Model F, and is similar in many ways to the Star Model F. Huon only lists barrel lengths of 110 and 185mm. Unlike the other R series guns, the R-22 did not have the feature which locked the slide open after the last round was fired. Production of the R-22 in .22 short began on 26 July 1954, and a .22 long rifle version appeared on 5 December 1954. According to Huon, production ended in April of 1965. 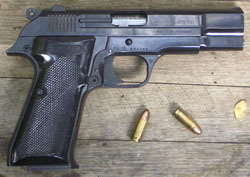 The P-8 (Pistolet Automatique 8), or PA-8, was a 9mm pistol designed for military and police use. Preproduction prototypes of the R-8 had an angled slot in the top of the slide in which the upper lug of the rotating barrel moved--these have become known as the R-Para Experimental in the U.S. The shape of the grip on the P-8 is clearly reminiscent of The P-8 was manufactured from 1966 through 1968. It had its connector bar on the left instead of the right. Like the Model R, it did not have a grip safety. The P-15 (Pistolet Automatique 15), or PA-15, was similar to the P-8, but with a 15-round double-stack magazine and a different grip shape. It was the first pistol to have a greater magazine capacity than the Browning Hi-Power. The P-15 was manufactured from 1966 to approximately 1985. The gun was still listed in the 1985 Gun Digest, but not in the 1988 issue. A target version of the P-15, designated the P.A.P. F1, was also produced. I haven’t been able to ascertain if MAB pistols were imported into the United Stated prior to World War II, but I don’t believe they were. 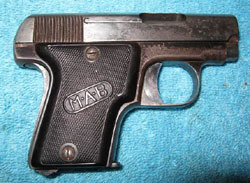 After World War II, MAB pistols were sold in the United States, first by the Western Arms Corporation, and later by the Winfield Arms Corporation, which was the distributor for Western Arms. I believe importation started in 1948 or 1949. The December 1950 issue of Popular Science featured an advertisement for the WAC Model A, shown with the WAC monogram on the grip. The 1951 and 1952 editions of Gun Digest list the Model A, Model C, and Model D as being available from the “Western Arms Company.” By 1954 advertisements are found for WAC pistols from the Winfield Arms Corporation. MAB pistols listed in Gun Digest in 1958 and later were given names. The Modèle A became Le Defendeur, the Modèle C became Le Cavalier, the Modèle D became Le Gendarme, the Modèle R .22 became Le Chasseur, and the Modèle R Para became Le Militaire. WAC was also importing rifles as early as 1953, which they advertised in American Rifleman. The MAB Model D was sold briefly by E.&M. Firearms of Los Angeles in 1954. They issued a catalogue, and I would very much like to find a copy of it and see if they sold any other MAB models. In 1960 Seaport Traders of Los Angeles were advertising the MAB Model G and R-22, and in 1961 they advertised the Model C, clearly shown with the WAC monogram on the grips. By 1962 Hunter’s Lodge of Alexandria, Virginia and Ye Old Western Hunter of Culver City, California (both subsidiaries of Sam Cummings’ Interarms) were advertising the MAB GZ and Le Chasseur. By the time the PA-8 and PA-15 pistols came out, MAB was no longer distributed by Winfield, as I have not seen one with WAC markings. The 1968 and 1972 Gun Digest list the MAB Autoloading pistol (8 or 15 shot) as imported by Mars Equipment. The 1973 and 1975 Gun Digest state that the P-15 was imported by Gold Rush. There are no listings for MAB pistols from 1975-1980, but the P-15 appears again in the 1983 through 1985 issues of Gun Digest, imported by Howco Distribution, Inc. Bastié and Casanova indicate that the director of MAB was introduced to the American owner of Howco, from Laurel, Maryland, while visiting the offices of FN in Belgium. The Howco owner wass not familiar with the P- 15, but he liked it and ordered 3000 of them. The City of Bayonne and the M.A.B. factory were controlled by German occupation forces from the Summer of 1940 until late in 1944. Josserand states that French production of MAB pistols did not resume until after the liberation of France. Huon states that production resumed in 1945, while Bastié and Casanova state that it happened in 1946. As noted above, Leon Barthe died in 1937. After the war his son, Jean Barthe, completed his education in mechanical engineering and assumed control of the company. Most of the guns were redesigned in minor ways to allow for fewer manufacturing steps, which would in turn speed production and reduce costs. According to Bastié and Casanova, French legislation of 1939 prohibited the carrying of weapons by civilians so there was no longer much of a market for 6.35mm pistols in France. This led to the elimination of the Model B in 1949 (although it continued to be sold from stocks for many years). The company decided to produce some new models and to try to reach new markets. Model E production began in 1949. Model F production began in 1950, in the hope of capturing some of the market in guns for target shooting, which had begun to show a resurgence in France as it recovered from the war. The Model R also appeared in 1950. 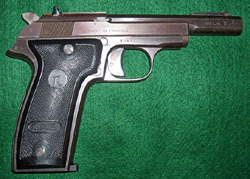 Initially intended as a replacement for the Model D for military use, the R was first issued in the standard .32 French Long cartridge, but MAB was unaware that the French military had already decided to move to the 9mm Parabellum cartridge, so there was no market for the gun in this caliber. The R was then introduced in 7.65mm (.32 ACP), 9mm short (.380), and 9mm Parabellum, but none of these sold particularly well. Finally the R was produced in .22 LR caliber and found a limited market as a cheap target gun, though it never became the success the company had hoped for. Many of these various models were sold in the U.S. and the French colonies. The Model G appeared in 1957. On 15 January 1956 police siezed 600 MAB pistols in Nice which were smuggled out of the factory by communist militants for use by the Algerian Socialist party FLN, which was seeking to liberate Algeria from French rule. This somewhat tarnished the company’s reputation in the minds of many in the French government, who continued to associate the company in their minds with revolution. It did not help that the Basque separatist group ETA was also active in the Pyranees region on both sides of the border. In 1964 the company moved to a new factory in the Plontots area of Bayonne. Soon afterward a conflict with the board of directors lead the CEO to resign. The new CEO was Maurice Danjou, who previously managed the arena (bullring) in Bayonne. MAB tried to diversify its product line by manufacturing flare pistols and garden rifles. Over the next three years the number of workers at the MAB factory increased from 96 to 154, and annual revenue increased from 140 to 350 million Francs. Ninety-plus percent of company business was with clients in the Middle East. But after the Six Day War in 1967, the French government banned the export of weapons to the Middle East. MAB then tried to circumvent the embargo by routing shipments through Bulgaria to Turkey and finally to their clients in the Middle East, but the government found out about the deception and revoked MAB’s export licenses. The company was forced to file for bankruptcy on 7 March 1968. The factory was occupied by its out-of-work workers on May 16, who took the CEO and a member of the board of directors hostage for two days (a time-honored tradition in French labor). The factory contained a huge stock of weapons, and the workers were well entrenched. A member of parliament for the Pyranees region tried to negotiate a settlement in which the export licenses were to be reinstated and the government was to assist the company, but this settlement ultimately failed. The unions organized daily meals for the MAB workers who continued their occupation until legislative elections were held in June. The company was eventually purchased by Claude Duvignacq, the owner of a French baby products company, Baby Relax. With French legislation becoming ever more restrictive of gun ownership in the early 1960’s, MAB’s markets were drying up. In 1966 the company released an entirely new pistol, the P8, which was quickly redesigned to become the P15. The P15 met with a limited success in the U.S., Finland adopted it for use by its army, and sales were good in Africa where France still had many colonial ties. But when the French army tested it in the 1970’s they found that parts did not interchange well between guns. It seems that MAB had failed to upgrade its machinery to modern standards and was still hand-fitting pistols individually. By the mid 70’s the company was again in financial trouble and was reorganized in 1976. The director, Vincent Dubecq, who at this time owned most of the company, left to start two precision engineering companies. He took the best engineers and the most experienced workers with him. The new director, Marcel Gozzi, knew little about weapons. Soon after these changes Fabrique Nationale (FN) of Herstal, Belgium acquired a 40% interest in MAB. FN’s intent was to enter the bidding for new French military arms contracts. At the time France required that production of French military weapons take place in France by a French company, and MAB was to be FN’s foot in the door. However, due to the Belgian government’s awarding their fighter plane contract to Lockheed for the F101 fighter instead of to the French firm Marcel Dassault for the Mirage fighter, the French government decided to exclude FN from bidding for the new French military rifle contract. This was a severe blow to both FN and MAB. In 1978, production of the Baby Browning was moved to the MAB factory in Bayonne. But the major product of MAB continued to be the the P15. MAB barely managed to turn a profit in 1981, but the new director, Marcel Gozzi, had begun to realize how obsolete MAB factory equipment and methods were. He caluclated that for the company to remain profitable it needed to cut production times in half. In addition, the unionized staff was very unhappy. Gozzi called in experts from FN to help redesign the production line and come up with solutions for speeding output. The complex milling of P15 frames was eliminated and outsourced to the Spanish firm Astra, where the frames were precision cast quite economically. In return, Astra outsourced some of the finishing and assembly work for FN’s Barracuda revolver to MAB. Under partial ownership by FN the MAB factory also made parts for the .22 Sport rifle, and MAB was able to sell its products through FN’s sales channels. Probably in 1981, the American company Howco Distributing ordered 3000 P15 pistols to sell in the U.S., and commented that it was too bad they didn’t make it in .45 caliber. When the chairman relayed this comment to his staff the production foreman produced a prototype in .45 caliber that he and two of his workers had already made, so the chairman began making plans for a new gun that would have interchangeable 9mm Parabellum and .45 ACP barrels. MAB ultimately became the victim of French labor unrest in the era. Management had signed a contract with Landes Nickel Plating to plate parts for the P15, but Landes had bad labor relations and the MAB union workers refused to work with them. MAB was forced to cancel the contract. Labor unions across France were agitating for a 35-hour work week, and the MAB union members were convinced that FN had deep pockets and would continue to fund the company no matter what labor demanded. 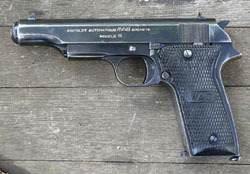 Astra rejected a third of the pistols finished and assembled in the MAB plant for substandard polishing and blueing, causing further labor issues. In March of 1982 one of the workers replaced blank cartridges used for testing guns with live cartridges which were shot inside the factory with workers present. The person responsible was fired, which caused the union to go on strike. By September the company was bleeding money and FN withdrew all financial support. The director resigned, the workers were dismissed, and that was the end of MAB. A very small number of supervisors and workers were hired by companies owned by the former CEO. After the closure of MAB several of its former executives founded a company called MABCO in 1986, which resumed production of the P-15, the P.A.P. F1, and parts for MAB pistols. MABCO also revived development of the convertible pistol in 9mm and .45 ACP, as well as a double-action version of the P-15 which they hoped to sell to the French military. However, neither gun ever progressed beyond the prototype stage. MABCO had plans to modernize production methods and redesign the P-15 so that it could be manufactured with CNC (computer numerical controlled) machine tools, but were apparently unable to obtain sufficient financing to implement this plan. There were rumors at one time that MABCO would move production to the former Yugoslavia, but nothing ever came of them. I do not have an exact date for the demise of MABCO, but Bastié and Casanova indicate it was sometime in the early 1990’s. MABCO was the last remaining manufacturer of large caliber handguns in France. The French ultimately ended up replacing the venerable MAC-50 with the Beretta 92F, which was the first foreign made gun ever to become the standard-issue French military sidearm. 2005 Standard Catalog of Firearms, by Ned Schwing. KP Books, Iola, WI: 2004. “Collecting Modern French Pistols,” by Major Richard J. Keogh. Arms Gazette, March 1980. FN Browning Pistols, by Anthony Vanderlinden. Wet Dog, Greensboro, NC: 2009. French Service Handguns, 1858-2004, by Eugene Medlin and Jean Huon. Tommy Gun Publications, St. Louis: 2004. Guns, Third Edition, by Hy Hunter. Wilcox & Follett, New York: 1956. The Illustrated Encyclopedia of Handguns, by A.B. Zhuk. Greenhill, London: 1995. “Les Prototypes MAB,” by Bernard Meyer. Gazette des Armes, No. 200. Copyright 2008-2015 by Ed Buffaloe. All rights reserved.